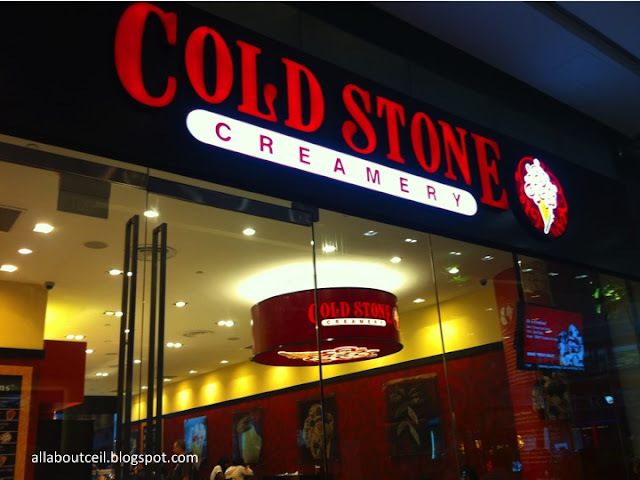 First experience at Cold Stone Creamery Singapore was a disappointing one. I was attended by Amiz. After telling him i wanted to order 'Berry Berry Good', he went off too quickly without asking me on the size that i want, he started making the ice cream and then he put it in the 'like it' cup. I was disturbed then i asked why did not he ask me on the size that i want, or whether i want it in a cup or a waffle cup. And, how can he assumed that i want a 'like it' size without me mentioning it and he asking me? Someone by the name of Mark stepped in, he offered to change it. I accepted it. He sorted it out well, so i guess i should not be complaining it. But first impression is always important. I was excited but later it turned to be disappointment, and it indirectly spoiled my day. 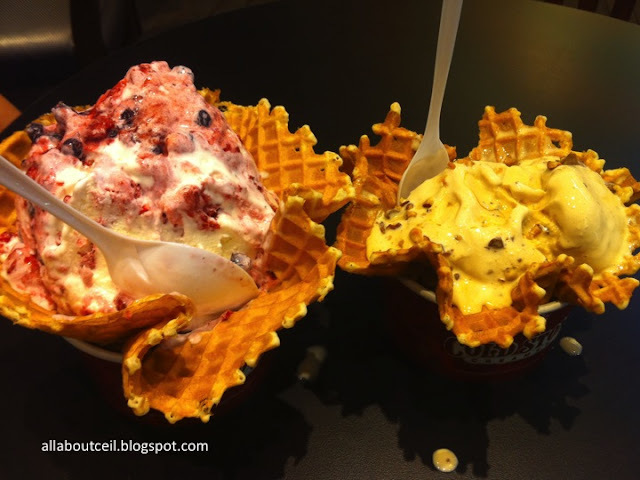 I got an extra big waffle cup and extra big ball of ice cream. But the berries especially the strawberries tasted sour. I did not quite enjoy it. Coffer Lover, this is definitely nicer than the 'Berry Berry Good'. 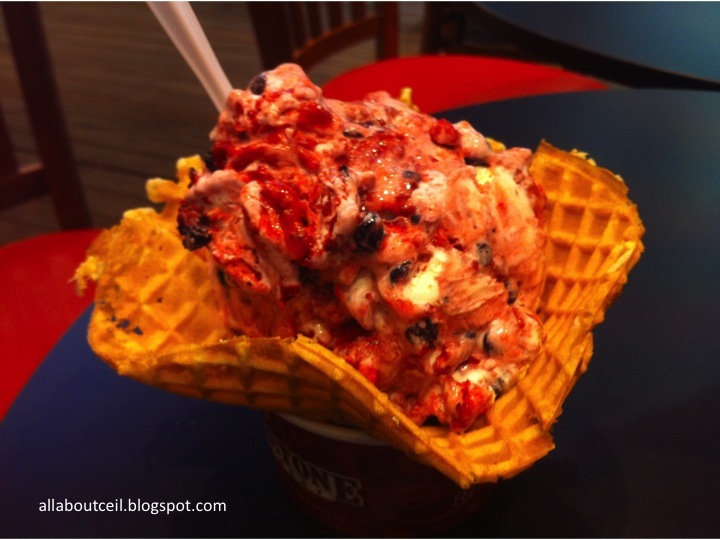 But, the ice cream melted too fast, and it definitely not a good thing. Those that we had in Taiwan were a little firmer and it took a longer time to melt. You might be thinking it has something gotta do with the hot weather in Singapore, but today happened to be a rainy day, and it was quite a heavy rain, so how hot the weather can it be? I thought it might have something to do with their technique, i did observe that the staffs were not too professional when they were doing it. Perhaps more practices would make perfect but they are definitely not quite there yet. The difference in size is rather distinctive, does that mean their standard is inconsistent? Other one is definitely so much smaller in size, and the melting ice cream is a definite turn off. I have another set of discount vouchers for 20 March 2011, but i doubt i am going back there so soon. I do not wish to be disappointed again and most importantly, i do not want my day to be spoiled. And, if you thought of visiting Cold Stone Creamery Singapore soon, you might want to consider to hold back a little, the staff are not quite well trained yet. They did not mix the ice cream well, certain part of the ice cream was just plain vanilla, and some of the berries were still rather chunky. But if you do not have prior experience for comparison then you might find it acceptable. There is definitely room for improvement for their customer service. When we last had it in Taiwan, we did not order any drink, while we were eating it, a nice waitress actually went around with few plastic cups of ice water and served to those that did not order drink. 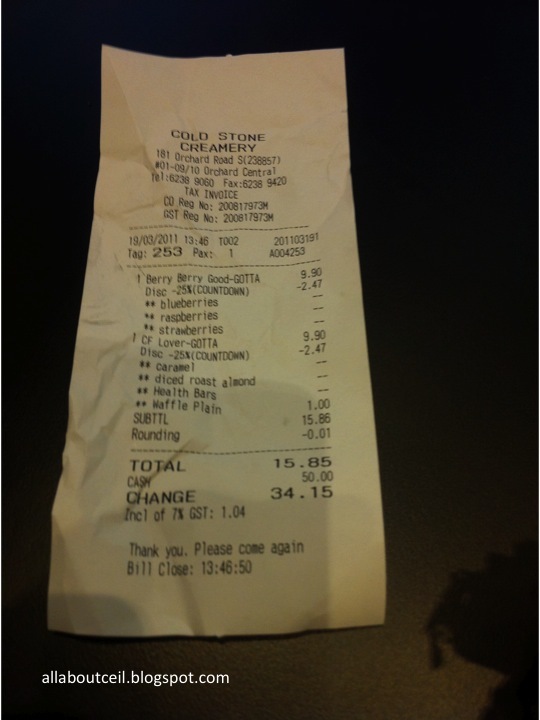 Maybe, the Cold Stone Creamery Singapore here might want to consider providing such value add service that would help to bring its customer service to a higher level. Honestly, i do not expect much of customer service in Singapore. 'Got to have it' is $9.90 and the Waffle Cup is $1.00. 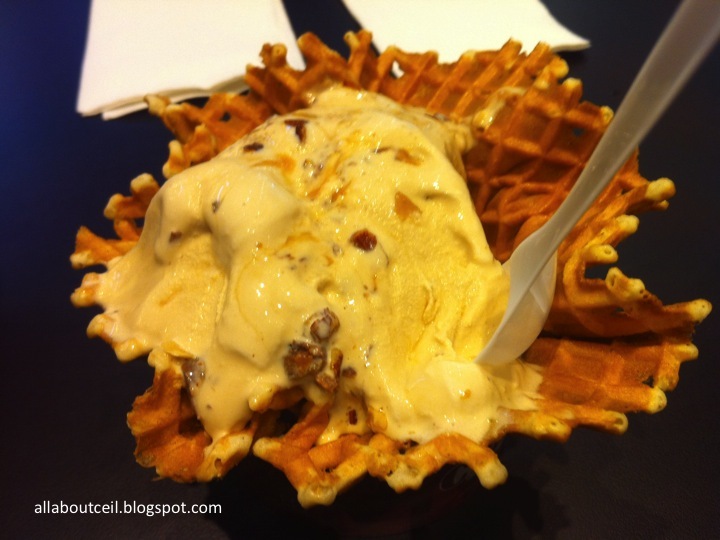 The waffle cup is nicely made, and it definitely worth the extra dollar.